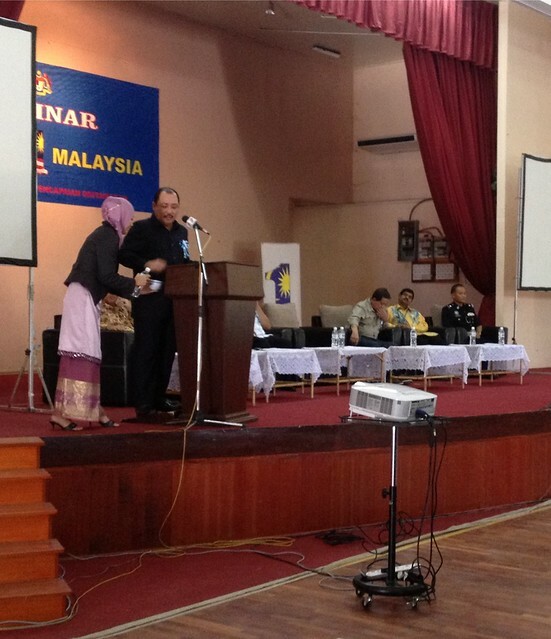 "Minum dulu, Datuk", an organising committee member offering Datuk Hajiji Hj. Noor a drink during the closing ceremony. It was an interesting session with the Village Heads and JKKK Chairpersons whereby they get some insight of the ongoing government transformation programs. A relatively brief session considering the large crowd turnout from Tamparuli, Kiulu and Tuaran. I wished there was Q&A session so that participants could ask questions and bring forward suggestions and comments. I've wanted to ask about the GST implementation and seek clarification on how it will champion the interest of the generally poor people, or at least how this would benefit them. Tuaran is not one of the Districs with better income population. Then again, seminar lke this may not be the venue for such dialogue. Datuk Hj Ibrahim seem to be a well learnt person and he should've been able to provide a reasonably good answer to such query.